For tonight's dinner, I explored another recipe from Marcus Samuelsson's new cookbook, New American Table. Unlike with my recent post on German Street Pretzels and Beer Braised Short Ribs, where I stuck closely to the recipes as laid out in the cookbook, with tonight's pasta dish, I couldn't resist making some considerable variations, despite the fact that I am attempting to test the recipes in the cookbook. However, the dish that I did come up with was a winner, was inexpensive, fast and easy to make, and will make for great leftovers for lunch tomorrow. Here's the recipe that I followed with a discussion below that sets forth how the recipe deviates for Samuelsson's "Spicy Tomato Arugula Angel Hair" on page 276 of his new cookbook. First I cut the tomatoes and put in a bowl with the salt and allowed them to absorb the salt while I worked with the other ingredients. Samuelsson's recipe actually calls for a mixture of yellow and red tomatoes, but it is pretty hard to find yellow tomatoes in December in the Northeast, so I had to make due with red ones off the vine. Next, I started boiling the water and when it reached a boil, added a box of angel hair pasta. In the meantime, I prepared the sauce in a large saute pan. I first added the olive oil, garlic and shallots and sauteed for a few minutes. I used a bit of extra garlic, since I like the taste of garlic in my pasta. 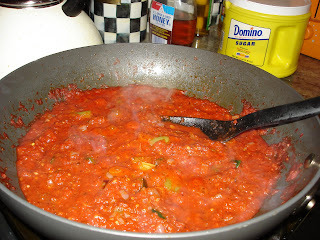 Then I added the crushed tomatoes, which I chose to add more of than Samuelsson, whose recipe only calls for a 14 ox can. I also added the peppers at this point, because I prefer to have them cooked into the sauce to mix the flavors, rather than crunchy and added at the end like the recipe called for. The recipe in the cookbook calls for 2 Anaheim Chiles. It is a misnomer that all chile peppers are spicy, because anaheims are actually extremely mild. I decided to add only one anaheim and throw a polombo chile into the mix because I thought the mild taste and distinctive smokiness of the polombo would go well with the tomato and arugula. This turned out to be an excellent decision, as I loved the smoky hints in the sauce that were introduced by the polambo. I added the oregano, pepper an thyme (my addition) and sauteed for about five minutes. 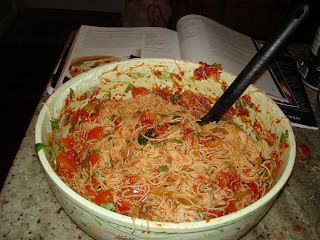 Then, I tossed with the fresh tomatoes, arugula, Parmesan, red pepper flakes and angel hair. Red pepper will make your pasta spicy in a hurry and I wasn't in the mood for more than a tiny bit of heat, so I cut down on the red pepper flakes accordingly (the original recipe calls for 1 tsp). So if you prefer to have a spicy sauce, you can add more of the red pepper flakes. The arugula is key in this dish, as it adds just a touch of bitterness that goes nicely with the other flavors. 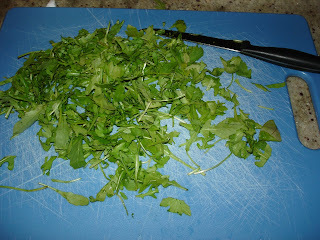 I love arugula in my "italian" cooking (in pizza too), so I added extra. When I was making this dish, my husband wasn't sure I needed to add the tomatoes at all, since he thought the sauce looked so delicious. But in the end, we were glad that we did. The fresh tomatoes, which were not cold at all by the time they were mixed with the hot sauce, added texture to the dish and brought out the flavors in the sauce nicely.